Say goodbye to the city lights and take a journey to the top of the world at Alila Jabal Akhdar. Perched on the edge of a ravine overlooking a dramatic gorge in the central section of the Al Hajar Mountains in Oman is the majestic Alila Jabal Akhdar. This exclusive hotel has 86 beautiful suites and villas and a wave of relaxation washes over you from the moment you arrive. Whilst you could easily spend an entire day admiring the mountainscape, there are plenty of activities to immerse yourself in to truly avail of the Alila experience. Those with an adventurous spirit will love taking on the via ferrata cave adventure. It dares you to step out onto 20-metre-high ropes and traverse a cave mouth, offering incredible views of the landscape. If the adrenaline rush of a thrill-seeking adventure isn’t for you, there are plenty of other activities you can choose to participate in (with your feet firmly on the ground) like trekking, cave explorations, cooking classes, a butterfly trail and stargazing where an astral guide will point out planets, stars and galaxies that are so clearly visible away from city lights. 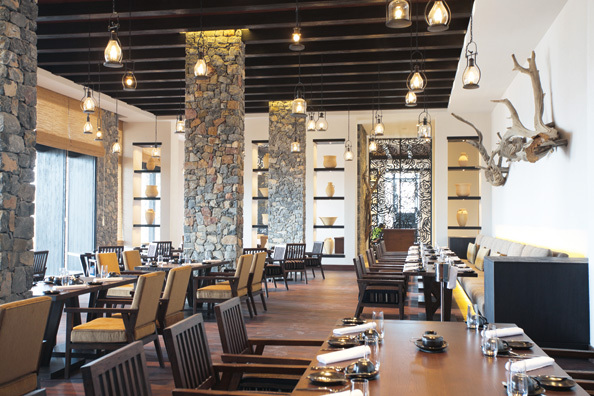 You’re guaranteed to have worked up an appetite after a day of exploration, so be sure to book yourself in to Juniper restaurant, which is named after the Juniper trees that grow in the highlands of Oman, for dinner. You’ll enjoy international cuisine with an Arabic influence as you take in the sunset over the mountain range. Rejuvenate your tired muscles with a sunrise yoga session – breathing in the fresh air is sure to help – or book yourself in to the Alila Spa for a relaxing treatment with one of the spa’s highly qualified therapists. Come check out, you’ll already be planning your next visit – this truly is a place for the mind, body and soul. A two-night stay for two in the Jabal Terrace Suite including daily breakfast, lunch and dinner at Juniper restaurant. You also have a choice of: one activity from the Alila Experience, one treatment at the Alila Spa or Yoga (scheduled sessions). Welcome Kahwa, a fruit basket in your suite, stargazing, access to the gym AND infinity pool and in-room and public area wifi acess is also included.